CorShield is a multiple-layered protective fabric with a non-woven, soft inside layer. CorShield Fabric is made from low-density polyethylene tapes, a high-density coating and a non-woven laminated on the inside. CorShield Fabric protects valuable items from corrosion and mechanical damage (i.e. scratching) during storage and shipment. 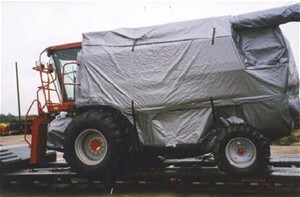 CorShield Fabric offers complete protection to valuable items from machinery to vehicles. Reusable and recyclable CorShield Fabric can be sewn to custom sizes and covers. CorShield Fabric is the solution for corrosion packaging problems. Incorporating Cortec's proven Vapor phase Corrosion Inhibitors (VpCIs), this fabric is effective for preventing corrosion on many types of metals. CorShield Fabric provides outdoor long-term protection against UV exposure (up to 5 years in sunny and hot climates). Size: 68" x 500' (172.7 cm x 152.4 M) roll. Shipping Weight: 165 pounds per roll.